Our guests this week are Kalu James and JT Holt of Kalu and The Electric Joint, along with Grace Park and Jesse Otis Dalton of The Deer. Writing On the Air is broadcast live each Wednesday from 6-7 pm Central from the KOOP Radio studios in Austin, Texas. We are heard on 91.7FM KOOP – Austin, and online at KOOP.org, TuneIn.com and Radio Free America. Episodes are available in the Radio Free America archive for two weeks after broadcast. Did you know we have over 150 podcast episodes? We sure do. To listen, just scroll/search our guests here on our website and download the audios from each episode; or you can download our podcast from the Podcast app and iTunes. For show updates, be sure and follow us on Facebook and Twitter. We’re super glad you’re here, and thanks for listening to our show. Kalu and The Electric Joint blend the powers of psychedelic soul music with the driving beat of rock and roll and the ancient rhythms of Africa. Born in Nigeria, frontman Kalu James relocated to Austin where he put together a stellar ensemble of players who graciously fuel and follow his deep well of eclectic influences. The group’s new record, Time Undone is a sonic masterpiece of original tunes with a positive message and soul-stirring beats. The arrangements are masterfully crafted allowing the songs to breathe and flow. From the first note, these musicians show that they’re prepared to carry modern music forward while still paying tribute to the inspirations of their past. Their music invokes a wide range of emotions while influencing with an uplifting message through masterful playing. The musical chemistry of Kalu and The Electric Joint comes from the bond forged by Kalu James and guitarist Jonathan “JT” Holt, who adds a touch of American soul to Kalu’s West African heritage. Kalu and JT connected through the hustle of the Austin music scene, writing songs together and discovering immediately that the talents of each complemented the other. JT is a master song craftsman, who’s just as comfortable holding down the groove with his magnificent chording and rhythm as he is busting out a blistering guitar lead. 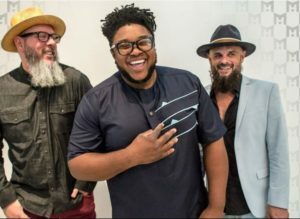 Drummer & Percussionist, John Speice, who had a longstanding Austin connection with JT also had spent his life mastering rhythms Kalu had grown up with, making him a perfect fit for the group. Opening for acts like George Clinton & The Parliament Funkadelic, Vieux Farka Toure, Allen Stone, Keller Williams among many others, Kalu and The Electric Joint comes to play and when they do, the dance floor never stays empty. Austin alt-folk band The Deer stands out with their versatile and accessible sound, weaving psychotropic soundscapes and tranquil, vivid dream-pop. The Deer won an Austin Music Award for Best Performing Folk Band and were Runners-Up for Best Austin Band in 2018. The band recently received a major grant from Austin music patron organization, Black Fret. They are currently recording their third album, while simultaneously touring across the universe. The Deer members include frontwoman and founder Grace Park (The Blue Hit), playing keys, guitar, and singing lead; Jesse Otis Dalton on upright bass, banjo and guitar (MilkDrive, Green Mountain Grass); guitarist Michael McLeod (Good Field, Linklater film composer); drummer Alan Eckert (Dimitri’s Ascent, A Live One); and their newest member, string player Noah Jeffries (MilkDrive, South Austin Jug Band). Frequent collaborator Roger Sellers (Bayonne) also adds some of his touch to their songwriting and production. The Deer have played Austin’s Moody Theater and the Legendary Stubb’s, as well as The Boulder Theater, The Fox Theatre (Boulder), and The Rex Theater (Pittsburgh). They’ve played Kerrville Folk Festival, Old Settler’s, Utopiafest, WinterWonderGrass, Oregon Country Fair, Campout for the Cause, Americanafest, SXSW, Northwest String Summit, and more. They have co-billed with Elephant Revival, Big Thief, Bayonne, Fruition, Wild Child, and Calliope Musicals. Grace Park is also an artist, making cut paper, stained glass, and graphic art. Grace sang before she could talk and drew before she could write, devouring Broadway musicals and comic books with constant attempts to reproduce them. Her formative years were spent singing in several choirs at church, school, and competition, and her visually-artistic skills continued to grow. Grace eventually decided to focus on music for her university schooling, specializing in vocal education at Texas State University. It was there she met her future bandmates, but she was shy about performing until an epiphany in 2005 that got her writing and singing professionally. By the time she graduated, Grace was in her first touring band, The Blue Hit, writing most of their songs and designing all their album art. She later founded The Deer. She’s also performed and recorded with several acts including Alejandro Escovedo, MilkDrive, Roger Sellers, Abram Shook, Fire in the Pines, Jack Wilson. 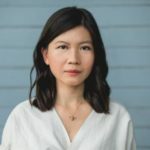 Grace won a 2014 Austin Music Industry Award for her artwork for The Deer’s first album, “An Argument for Observation.” As well as designing custom graphics for websites and marketing with a specialty in music-related media, she displays her original artwork in galleries. Kalu James and The Electric Joint and The Deer will be performing June 23rd at The Mohawk-Austin.